This heartbreaking note posted on my Facebook page started my kinship with an extraordinary man. He lived every parent's silent dread -- looking back on the senseless death of an innocent child asking "How?" and "Why?" and "What could have been done?" 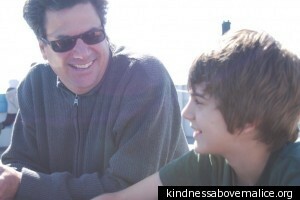 Kevin Jacobsen's son saw no alternative but to take his own life rather than face another day of relentless bullying. Kevin inspired those around him. He inspired me. When he spoke to a crowded room at the U.S. Department of Education at a bullying conference last fall, he roused them to a standing ovation. He hid his pain behind action. His notes to me about anti-bullying legislation were carefully considered. He served as a bridge to other families. He decided that no family should suffer as his did. Then came even more devastating news -- on January 7, Kevin, the father who had suffered and learned; the inspired leader of other families -- took his own life, too. I can't begin to say I have insight into this second act of sadness. Just that I was hit by an unrelenting wave of shock. I pray for Wanda and her family to find strength. My resolve now is even stronger. I will not stand by and see other families destroyed. We must defeat this issue. Parents, teachers, grandparents, and -- most of all -- kids, must band together and stop this epidemic in our schools and on our playgrounds. No child should ever be made to feel such desperation. No parent should have to lose a child this way. No wife should lose a husband and son. Join with me now. Our children deserve better. The Jacobsen family -- you are not alone. We will not stop until bullying recedes into the past and becomes nothing more than a sad chapter of inhumanity and a reminder that we must all stand together.